This fantastic personalised leather holdall for men and women is made from genuine leather and canvas. Your photos are printed onto both sides for maximum effect. Whether it's for the gym or weekends away, your personalised travel bag comes in two sizes and all feature internal pockets ideal for your important items. Our holdalls have a roomy interior, making them perfect for your gym sessions, weekend breaks or even as your daily work bag. For general use, the large bag can easily fit your laptop, books, documents, gym kit with room leftover for a quick grocery shop. The small holdall is sleeker and is ideal for times when you need to carry more than usual but without compromising on style. All holdalls have black rolled leather handles to provide added comfort when on-the-go. Awesome, the bag was everything I was expecting and more, my girlfriend loved it, thank you!!!! I got a personalised large leather trim holdall and I love it. It arrived really quickly and is super well made. I would not hesitate to use Bags of Love again. Who Are These Personalised Leather Holdalls Perfect For? Anybody who wants strong, spacious luggage that exudes style and class. Because they are made from supple, soft leather and lightweight canvas, they aren’t rigid, allowing the user to carry a substantial number of belongings with ease. Choose the leather holdall personalised with your boyfriend’s name for a bespoke sports bag, or treat your mum to a new weekend travel bag. For an extra touch, include a voucher for a hotel stay inside her new holdall before you gift wrap it. We use a flexible canvas and the finest of soft Italian leathers to ensure your holdall is sturdy, robust and durable. No two bags are the same. We hand make all holdalls to order, first printing your photo onto the canvas and then cutting the leather to size. The detail and finesse that has gone into this bag shine through in the excellent finish. We'd always say to make sure the subject is clear and has enough room around it to fit the shape of the bag. 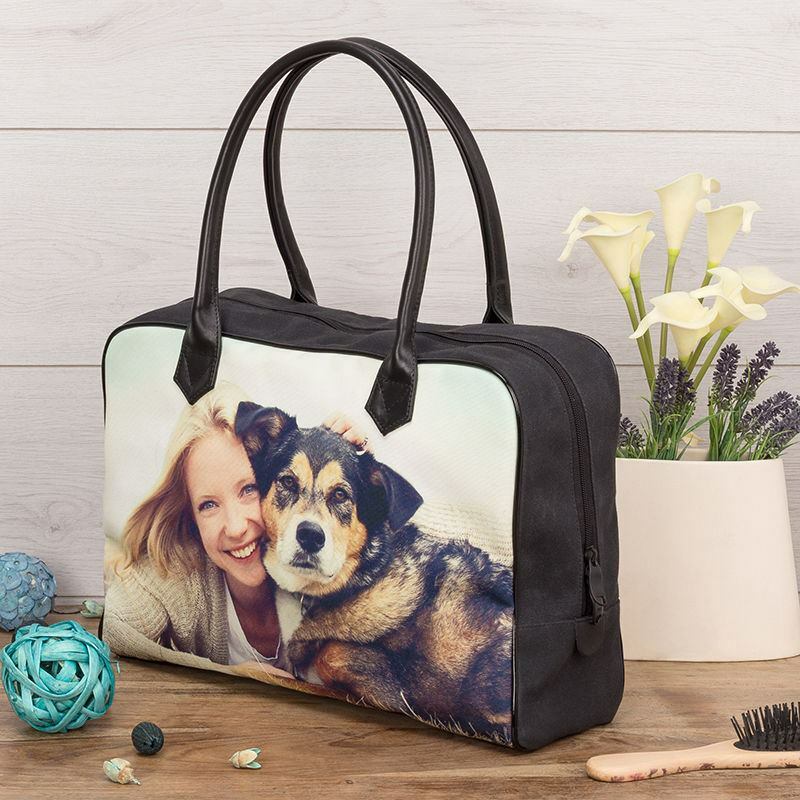 Keep in mind that approximately 1cm of the fabric print gets stitched into the holdall on all four sides so be sure that your photo doesn't feature key elements at the very edge of the photo. The handle position must also be taken into consideration, but we do our very best to avoid handles landing on any important features. You could choose your photo or design depending on how you want to use your holdall. For fitness motivation, overlay your photo with an inspirational message, or print a photo of your favourite athlete. They're also a great gift for couples who love a city or countryside break, so a photo of the New York skyline or English rolling hills would make for a beautiful, stand out design. For keen travellers, your holdall can be used as a travel bag personalised with a map of the world, or flags from different countries. Colour, monochrome, photo collages; the leather holdall is super versatile and can be tailored to men and women.